The rear lot line is the high point on the lot. Surface water on the property is drained to side yard swales along the common lot line and out the front of the property toward the street. The highest elevation is set near the midpoint on the property. 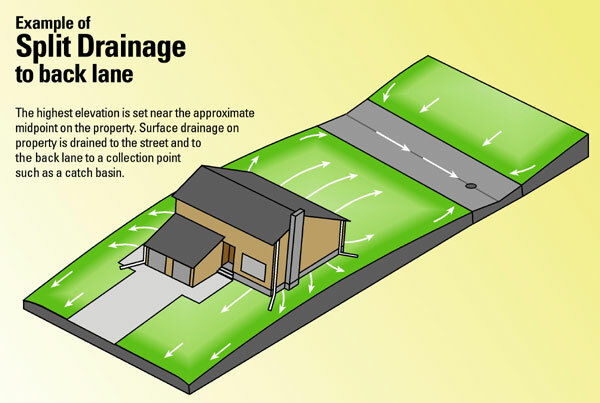 Surface drainage then flows to the street and to the rear lot line and onto the lane. 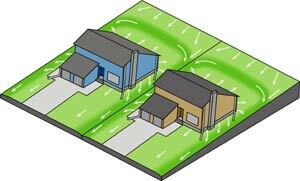 Surface drainage then flows to the street and to the rear lot line and onto a rear yard swale. 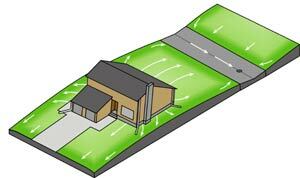 Note: It is very important to maintain elevations according to plan in a swale easement. Any change of elevation will affect not only the owner but also the neighbours. 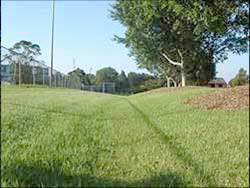 A swale easement is an agreement that is registered against a property. This agreement reserves a portion of land for land drainage purposes so that neighboring properties may properly drain their storm water runoff. must be maintained by the property owner. Do not cover any catch basins located in swale easements. 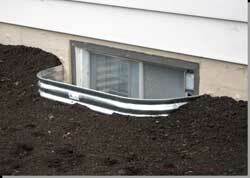 Doing so will affect drainage on your property and possibly your neighbour’s. Surface water must flow to the catch basins as part of the overall drainage design. 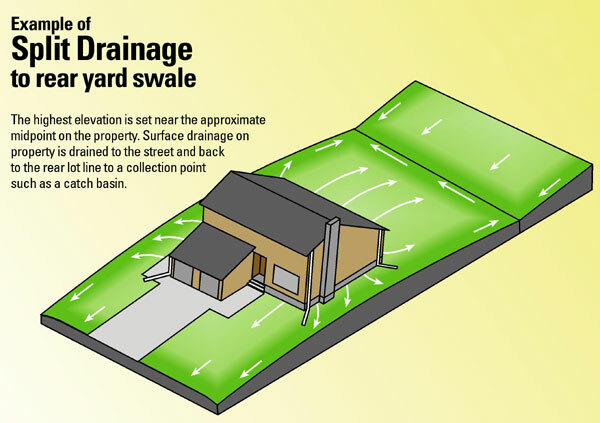 Swales must be unobstructed and free draining. Do not plant trees in a swale, as over time, a large tree can affect the drainage. Do not fill in the bottom with decorative landscaping material above the design grade as it will dam water when frozen. Keep fences at least 150 mm (6 inches) above the bottom of a swale to allow water to pass under it. 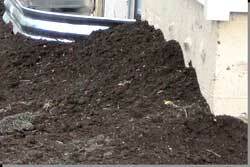 Shovel off the snow in spring to allow for earlier drainage as the snow melts. reduces the volume of water flowing to the weeping tiles. 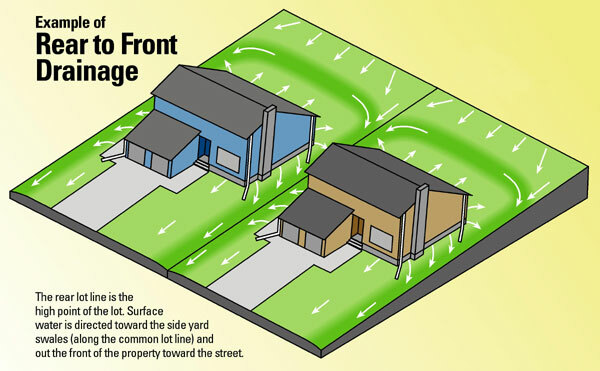 Build up the ground around your house so that water flows away from your foundation. Also, examine sidewalks, patios, decks and driveways. These can settle overtime and cause water to drain back towards the house. 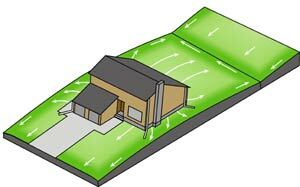 allow the ground around the basement/foundation to be raised to achieve proper slope away from the foundation. If you live in a condominium development, you and your fellow members of the condominium corporation are responsible for all drainage within the site.